How taking healthy risks in life helped me succeed! I’ve always enjoyed taking on a challenge, but that doesn’t mean I always succeed at everything I try. I have come to really appreciate my failures, because most of the time, they’ve led to better opportunities and experiences that I wouldn’t have had if I hadn’t failed at the thing I thought I wanted in the first place. This has allowed me to view failure in a completely new way – instead of being upset, I view every failure as an opportunity for improvement. And not only has embracing failure as a learning opportunity helped me learn new skills and confidence, but this approach has even been proven with research! Studies have shown that embracing failure as a learning opportunity can improve all aspects of young girls’ lives, particularly academics. 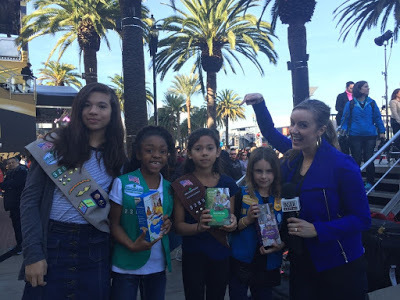 That’s why I am so excited to have the opportunity to collaborate with Girl Scouts. As a Girl Scout, you have a safe space to try new things and take healthy risks—the possibilities for what you can accomplish are endless. When I was growing up, there were a few times where things didn’t quite go as I had expected. From a very young age, I loved to act and would try out for roles in every play I could. Sometimes I got the part, but most often I didn’t. When I first started getting turned down for roles, I would get discouraged, but over time, this experience taught me how to pick myself up and keep working hard. It actually resulted in some great opportunities in films and TV later in life, and I still credit my middle school days for it! And just when I was about to quit, a door opened and I got a part. I was thankful I had auditioned so many times before, because those failures propelled me to be resilient, try even harder the next time, and never give up. Another great example happened when I was in high school and tried out for the varsity basketball team, the “cool” sport at my school. I gave it my all, but in the end I was devastated when I didn’t make the cut. I still wanted to get involved with sports, however - I just needed to pursue a “Plan B” by trying out for the volleyball team instead. I made the team and ended up loving it! Not only did I enjoy playing the sport, but I also made some of the strongest friendships I had with the other girls on that volleyball team. Our coach was a wonderful role model and taught me many valuable life lessons about competition, teamwork and the power of a positive attitude. I’m still grateful I took the risk to try out for basketball but didn’t make the team, even though I was convinced that it would be the best thing for me, because I learned to persevere and pursue new challenges. Sometimes your “Plan B” ends up working out better than the original plan, which only comes after taking a risk. Getting involved with the Girl Scouts offers amazing opportunities to take healthy risks, try new things, and learn to succeed through failure—an approach that I know has been an important driver in my own success, and has been proven to help girls lead better lives. My new book "Faith in the Spotlight" discusses many of the challenges I’ve encountered and how they’ve helped me achieve success and build a fulfilling life. I encourage Girl Scouts and young women everywhere to dive into every opportunity head first and take healthy risks. You will be glad you did! Megan Alexander is a national news correspondent for Inside Edition and the author of “Faith in the Spotlight – Thriving in Your Career While Staying True to Your Beliefs” (Simon & Schuster, October 2016). Connect with her on Instagram, Facebook, and Twitter.